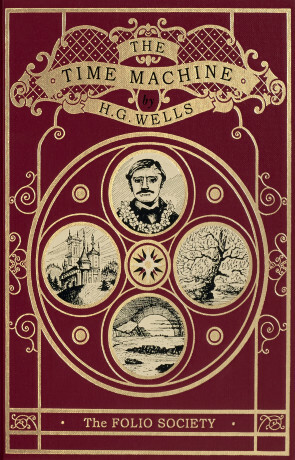 The work of H. G. Wells is both seminal and formative to our current interest in Science Fiction, Horror and Fantasy. The collection of these two novellas in one volume is a common publication format. However, The Folio Society has descended upon these texts with its customary panache and produced a gorgeously illustrated edition. This edition does tend to focus on The Time Machine, but does bring Well’s work to life with a treatment that mixes the Victoriana aesthetic with the quality of modern production. Wells’ writing remains instructive to those who might choose to follow in his footsteps. When considering The Time Machine, the story of a 19th century inventor who finds a way to travel into the future and glimpse the fate of humanity, the text is replete with the kind of ‘what if’ lessons we see considered in a particular brand of speculative fiction today. Wells explores the trends of society to excess, as other writers have done since, arguing the need for a Marxist element to how we live and suggesting that competitive struggle prevents stagnation, illustrating this with his far future experience amongst the Morlocks and the Eloi who are seemingly future humans, but have evolved into two divergent species. One trapped in a world of sunshine and indolence, the other in an underworld of darkness and cannibalistic hunger. Wells’ flawed narrator argues for continual conflict and class struggle today and in the future to ensure our society does not become biologically divided in this way. In some ways, this is an antique philosophy and even in its time, was seen as a simplification of Marx, but it does still resonate with today’s class divides, even if the solution may not be as obvious as our time traveller suggests. There is preserved element of curiosity and wonder to this story. We do not know what our narrator will experience as he moves further into the future. The relics and remnants of humanity in each time period provide a nostalgic anchor point, stirring the same kind of imagined mythology as Lovecraft's At the Mountains of Madness, but from the opposite direction. What happened to make civilisation change into this? Wells offers us glimpses and speculation. His writing encourages the reader to fill in the details for themselves and imagine the world as it will be. The illustrations, provided by Grahame Baker-Smith continue in this theme, showing us the snippets that Wells has described and leaving our minds to construct a narrative around the path of the story that might explain humanity's fall. By contrast, the Island of Doctor Moreau is both a more and less fanciful affair. The account is a journal from one Edward Prendig, a survivor of a shipwreck in 1887 in a remote sea location in the South Pacific. Prendig was presumed dead, but showed up a year later. His writing describe the strange things that happened to him when he was rescued and brought to Moreau's island. There is less illustration of this longer story in The Folio Society edition and this is perhaps for the best. Wells is using imagery in a different way in the second tale, and these is a need for claustrophobic imaginings of what might be going on behind a door and in the absence of our narrator as he strives to catch up with the action. As a result, we are treated to a much darker story that provokes the reader's mind into considering the detail of Moreau and Montgomery's awful work. The scientific basis of vivisection for Moreau’s experiments is less secure ground for Wells when compared to time travel, as our knowledge has moved on quite significantly since his time; as have our sensibilities in relation to violence and surgical torture. Prendig, Wells’ narrator for the story comes across as unfeeling and self centred at times. The decisions he makes expose him to danger and the situations he finds himself in often raise uncomfortable parallels to colonialism and the archetype of the superior white intellectual. The abusive treatment of the animals in the story leaves a lingering distaste for a modern reader, but then, reading Wells from a 21st century perspective does require a certain amount of refocusing. Rather than making an allowance for the historical context in which the work was written, once the reader lets go of a pretension that most of the characters are analogous to themselves, or particularly likeable, with the exception of the dogman, the text is much easier to accept. These are horrible people, whose intellect dooms them to a terrible fate. In some ways, the only regret might be that Prendig escaped to tell his story. But then, if we accept the fictional premise, we would not have the story to read. H. G. Wells’ work certainly has some qualities that can be criticised when revisiting it today, but these issues encourage healthy discussion and inform our thinking about modern stories. There is much here that influenced the generations of writers who came after this author and it is easy to forget the sequence of how our genres have developed since Wells’ time. This edition of two classic novellas is a beautiful treatment of two works that continue to inspire and stimulate readers more than one hundred years after their initial publication. Written on 3rd February 2019 by Allen Stroud.